With origins in the deserts of Mongolia, Manchuria and Northern China, the dwarf Roborovski, or "Robo," is the smallest of all hamster breeds. 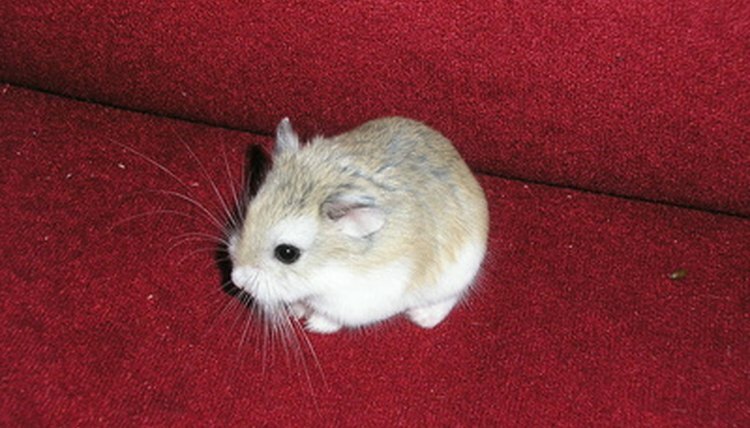 Although not as common or popular as certain other hamsters, such as the golden Syrian and teddy bear Syrian, Roborovskis are kept as pets in many households and are known for their active, energetic nature. When they are born, all hamsters are tiny, as well as hairless and unable to open their eyes, but in the case of the Roborovski, pups are especially minute. Pregnant female Robos can produce up to nine pups at a time and each will only weigh approximately 1 gram, which is the equivalent to the weight of a single pea or a single paper clip. Very small, indeed! Considering that the life span of a Robo is anywhere from two to four years, it should not be surprising that a Robo's growth rate is extremely rapid. After one or two days, whiskers will form and in less than a week, the Robo's body will be covered with visible hair. In three to five weeks the little hammies achieve full growth and sexual maturity. Once a Roborovski has reached maturity, generally by the age of 2 months, he is full-grown. According to such reliable sources as the Southern Hamster Club, Small Animal Channel and the National Hamster Council, a Roborovski's maximum size will be about 1.5 to 2 inches, or 4 to 5 centimeters. They have fairly large legs for a hamster of that size, making it possible for the Robo to move especially quickly. Any animal who is as small as a mature Robo will need to be handled very carefully. A Robo, though, requires particular care when it comes to handling because of his desire to remain active. Roborovskis do not generally bite; however, keeping a Robo is your hand is not an easy task and it is more than likely that the Robo will try to free himself as soon as he is picked up. Because the Robo is so frisky and so easy to lose if he jumps out of a person's hand, Small Animal Channel and North Star Rescue suggest that the Robo may not be the perfect pet for a small child or an older owner who is interested in a calm and cuddly hamster. The Robo, though, is a joy to observe and can be a great source of pleasure for the right owner.